US customers purchased 47,000 TVs, 41,000 pairs of Bose headphones, and 12,000 copies of Fifty Shades of Grey Unrated on Blu-ray. (Good job, America.) “We’ll definitely be doing this again,” Greg Greeley, Amazon’s vice president for Prime said at the time. But another number was much more important than any of those sales statistics: How many people enrolled to try Amazon Prime. While the company never released a specific number, it heralded the inaugural Prime Day as its best-ever for new Prime signups. Over the last year, Amazon added an estimated 19 million US subscribers to its signature membership program, which costs $99 year, according to Consumer Intelligence Research Partners. 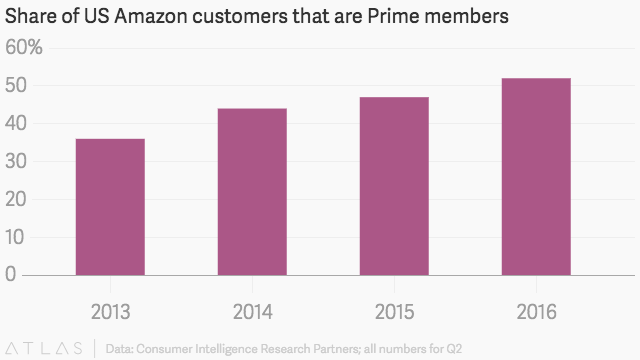 At the close of the second quarter, more than half of all Amazon shoppers in the US were also thought to be Prime members. No wonder, then, that Amazon is dedicating the whole frontpage to Prime Day in the markets Amazon is doing the event. Significant sales and a bump in Prime memberships and general awareness, what not to love?